My first impression was surprise. 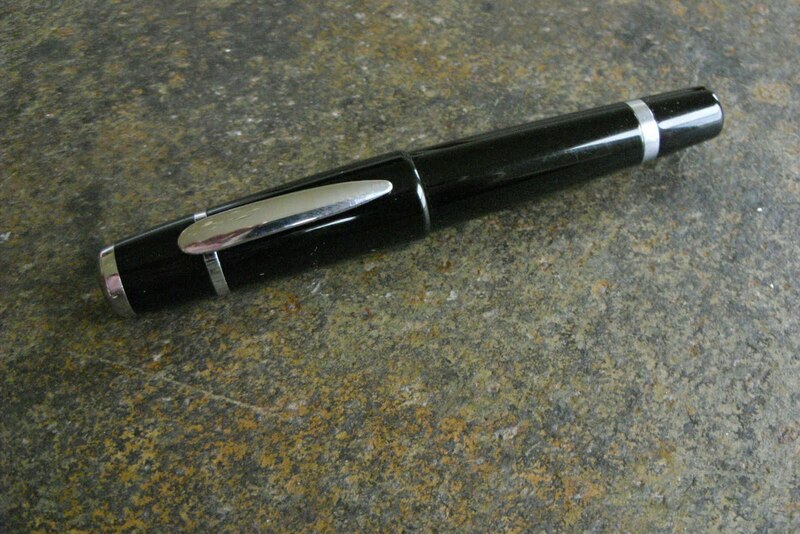 I'd never seen a Taccia pen before - never heard of them and then my wife who never tries to surprise me with a fountain pen picks out this one for my 50th birthday. She knows I love simple black and silver pens and chose a pen that I love. Thanks babe! I love the simple design. Very classy. I don't know why but I especially like the black dot on the top of the cap surrounded by chrome with the name "Taccia Portugese" etched in a circle: nice detail. Unlike the very poorly designed cap button on the Taccia Momenta, which carries an ugly TC logo in the middle. Also, the unusual placement of the threading at the base of the finger flare just above the nib is an interesting feature. Excellent. Possibly the best steel nib I have ever written with. Mine is a medium but writes on the narrow side of medium and kind of wet. This nib has never dried out, never skipped, never needed rinsing. It writes instantly every single time. Plus the nib has a slight italic character to it - kind of flat on the tip - and so it writes with some character. I use J. Herbin's Cacao du Bresil. Only draw back: the barrel is too short for a long converter. 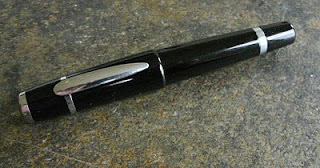 So you are stuck using the short Monteverde plunger style converter or cartridges. I use the short converter and runs out of ink fast. I am thinking this might be a good candidate for an eyedropper conversion. It was a gift so I'm not sure about the cost. I suspect around $70. And at that it writes better than any other pen I have in that range. The closest competitor might be a Lamy Studio but the Taccia Portugese writes even smoother than the Lamy - compared both out of the box with no adjustment. 7. Clip. This pen has got a great clip. It is springy and has a ball on the underside rather than that folded sheet metal design that many pens have, so it doesn't tear up your shirt pocket when you take it in and out. Also, the cap and clip design don't create an unintended vent that causes the nib to dry out. It is a 10. I love this pen but it probably wouldn't be good for someone with big hands. I have medium sized hands and I find it would be more comfortable if the barrel was longer, but that's partly because I don't prefer to post the cap. I'm guessing the Portugese Imperial would be perfect for man hands. I loved the Taccia Portugese so much that I recently purchased a Taccia Momenta. It is also a well made pen and writes well. it is considerably longer and a some heavier than the Portugese, but frankly the design is too busy for me. I liked it in the photos but not so much in person. So, the Momenta is up for sale on eBay. Pretty pen, congratulations and happy birthday! I have a Taccia Staccato and really like it a lot.